Carlton Mitchell (born April 6, 1988) is an American football wide receiver who is currently a free agent. He was drafted by the Cleveland Browns of the National Football League (NFL) in the sixth round of the 2010 NFL Draft. He played college football at South Florida. Mitchell played college football at South Florida, where he was the school's career leader in receiving yards until his record was broken by Andre Davis in 2014. He announced on January 9, 2010 that he would forgo his senior season and enter the 2010 NFL Draft. Mitchell is also a member of Phi Beta Sigma fraternity. Mitchell was drafted by the Cleveland Browns in the sixth round of the 2010 NFL Draft. In the 2010 NFL Season he played in five games as a rookie. In 2011 he played in eleven games catching three passes. On August 26, 2012, Mitchell was released by the Browns after being hampered by a leg injury in training camp. Mitchell was signed by the Jacksonville Jaguars on November 21, 2012. He was released on November 24, 2012. Mitchell signed with the Dallas Cowboys on January 7, 2013. He was released on May 29, 2013. On June 4, 2013, Mitchell signed with the Tampa Bay Buccaneers. On August 26, 2013, he was waived by the Buccaneers. On October 14, 2013 Mitchell signed with the Edmonton Eskimos. In the 2013 CFL Expansion Draft, Mitchell was selected with the 6th pick in the first round. 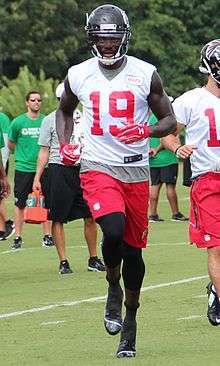 Mitchell was a member of the Atlanta Falcons in the 2015 pre-season, but did not survive the finals cuts as he was released on September 5, 2015. ↑ "Jaguars place QB Gabbert on IR, ending his season". Yahoo! Sports. 2012-11-21. Retrieved 2012-11-21. ↑ "FALCONS REACH 52-MAN ROSTER". atlantafalcons.com. September 5, 2015. Retrieved September 5, 2015.